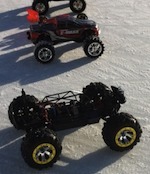 On the ice rink, entertainment with radio controlled electric cars, models from 1:12 to 1:5. Electric motors only. Organized by the Mairie in partnership with the Federation Monegasque de Modelisme and MC Clic. For more information phone +377 93 15 06 09.